Give the Gift of Education in the form of a Gift Card. 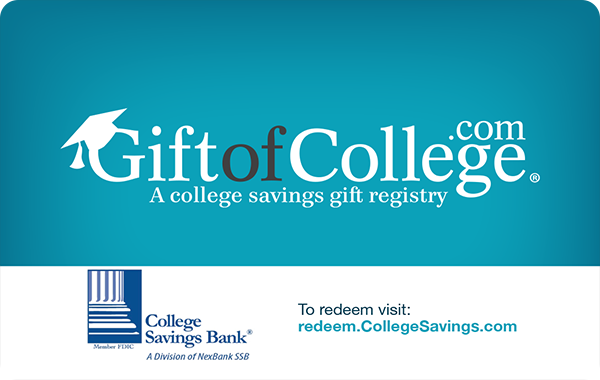 Grow your loved one's college savings account with help from family and friends, all year round. 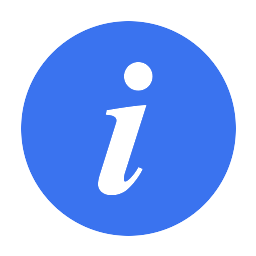 You may choose to have a physical card delivered to you, if you have time; or get an instant link via text or email. 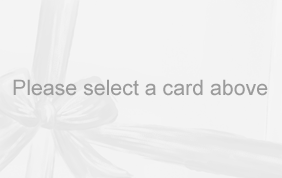 Gift card denominations range from $25 to $200. They are easy to purchase and easier to redeem into an existing account or you can enroll online today. Convenience and delivery charges may apply. There is no expiration date for redeeming the funds. Try It Today! Q: What are the convenience and delivery charges? No portion of the Convenience and Delivery charges go to NexBank SSB, College Savings Bank, a Division of NexBank SSB, the state of Arizona, the Arizona Commission for Postsecondary Education, CollegeChoice CD 529 Savings Plan, Indiana, nor the Indiana Educations Savings Authority. A: Online redemption requires you to type the card number in as a part of the order and may also require the use of a PIN or other code shown on the eGift Card. A: If you have lost your card, and the value still remains on that card, please contact support at 855.863.2292 and we will reissue the card. If the card no longer contains value, and you feel that this was fraudulent in nature, an investigation will be conducted. Resolution may require that the customer sign an affidavit with a notary public relative to the missing product. To begin an investigation into such an issue, please contact support. 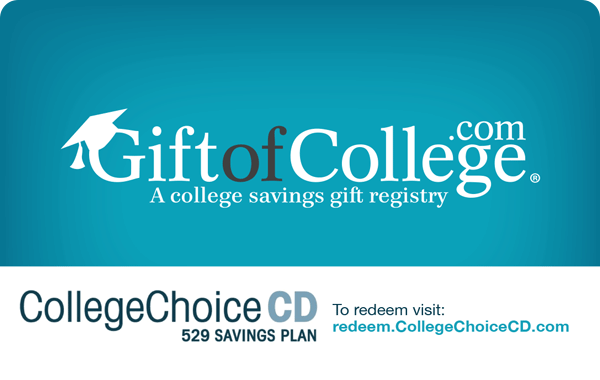 The total amount includes a Purchase Charge per gift card, which covers distribution and processing costs associated with the Gift of College gift card. No revenue derived from this charge is distributed to az. No portion of the Delivery Fee go to NexBank SSB, College Savings Bank, a Division of NexBank SSB, the state of Arizona, the Arizona Commission for Postsecondary Education, CollegeChoice CD 529 Savings Plan, Indiana, nor the Indiana Educations Savings Authority. No portion of the Purchase Charge go to NexBank SSB, College Savings Bank, a Division of NexBank SSB, the state of Arizona, the Arizona Commission for Postsecondary Education, CollegeChoice CD 529 Savings Plan, Indiana, nor the Indiana Educations Savings Authority.